For those of you who do not know me, I was an Allstate Insurance Agent for 25 years. I have recently sold my business due to health problems caused by a Cingular cell phone tower located 12 feet from my office. I now feel it was fate that placed it there to let me know it was time to move on to next stage of my life. This stage will still be helping humanity in one form or another. I am very appreciative of my 25 years with Allstate. It has been an amazing experience. The best part has been all the truly wonderful people whom Ive had the privilege of calling my clients. I would have never been able to be in the business that long without great clients. Thank You! Thank You! Thank You! The purpose of this site is to show you another side of me other than the insurance person who has taken care of your families for 25 years. 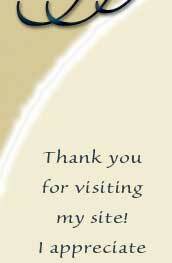 My Blessings to All who have experience my site.